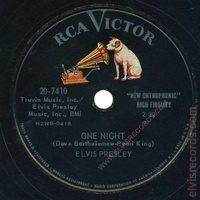 This is the last U.S. Elvis release on 78 RPM issued by RCA. Released in 1958 by RCA Records on 45 RPM as One Night / I Got Stung. Re-released by RCA Records on 45 RPM as One Night / I Got Stung on the Gold Standard Series label.